Volume 28 of The Annual features stimulating, original essays on the relationship between psychoanalysis and the neurosciences. Edelman's Neural Darwinism informs Barry's investigaton of the psychoanalytic theory of internalization and Fajardo's reassessment of "breaks in consciousness" whereas Gedo's hierarchical model of mental functioning informs Fisher's presentation of the treatment of an autistic child. Elsewhere, Hadley proposes a neurobiologically distinct motivational system devoted to the development of autonomy; Solms attempts to bridge psychoanalysis and the neurophysiology of dreaming; Levin and Trevarthen examine the relationship of conscious and unconscious functions to the executive control network (ECN) of the brain; Levin examines the contributions of chaos theory to psychoanalysis; and Modell explores metaphor as the crucial aspect of the developing mind and brain through which cognition itself occurs. Moraitis's examination of why analysis has been so slow to integrate its findings with the insights of contemporary neuroscience and cognitive psychology, and Sadow's reprise on the role of theory in the evolution of psychoanalysis usefully frame the contributions to this section. Section II of Volume 28 reengages a subject area for which The Annual has become well-known. The four characteristically excellent studies in applied psychoanalysis found here cover the effect of early father loss on the work of the American watercolorist Charles Burchfield, "The Creativity of Women," the unconscious influence of metaphor on attitudes and value judgments, and the application of self psychology to the dramas of Eugene O'Neill. 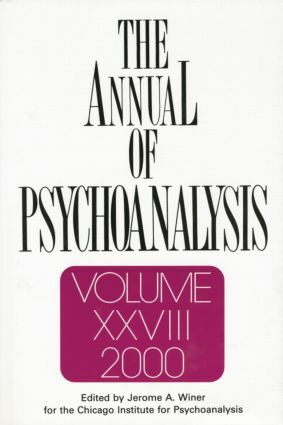 It is altogether typical of this fine series that a collection of essays dedicated to the development of a psychobiologically sophisticated psychoanalysis should be followed by contributions that testify to the explanatory vitality of psychoanalysis with respect to issues of literature, art, and creativity. Part I: Psychoanalysis and Neuroscience. Barry, Reflections on Interactive and Self-Organizing Aspects of Learning in Psychoanalysis. Fajardo, Breaks in Consciousness in the Psychoanalytic Process: A Dynamic Systems Approach to Change and a Bridge to Edelman's Mind/Brain Model. Fisher, A Case Study of an Autistic Child: A Reappraisal. Hadley, Discussion: Psychoanalytic Talk and Neural Sculpting. Levin, Learning, Development, and Psychopathology: Applying Chaos Theory to Psychoanalysis. Levin, Trevarthen, Subtle Is the Lord: The Relationship between Consciousness, the Unconscious, and the Executive Control Network (ECN) of the Brain. Modell, Are Mental Functions Hierarchical? Modell, The Transformation of Past Experience. Moraitis, Knowledge and Ignorance in Psychoanalysis. Sadow, About Theory. Solms, Preliminaries for an Integration of Psychoanalysis and Neuroscience. Part II: Applied Psychoanalysis. Beiser, The Effect of Early Father Loss on an Artist's Work: Charles Burchfield. Gedo, The Creativity of Women. Melnick, Cold Hard World/Warm Soft Mommy: The Unconscious Logic of Metaphor. Miliora, Heinz Kohut and Eugene O'Neill: An Essay on the Application of Self Psychology to O'Neill's Dramas.